Is Mineral Make Up Just Hype? Why All The Mineral Make Up Hype? The mineral make up debate rages on among makeup artists and addicts. But what really, is in the makeup formulation? It's basically regular makeup, with most of the bad stuff taken out of it and a higher percentage of the minerals added in. You'll find less irritants like dyes, preservatives, mineral oil and fragrance. This is why mineral make up has become a hit with so many women. It doesn't irritate sensitive skin as much as regular make up. The absence of mineral oils, also makes the makeup friendly to acne prone skin. The products are in line with many people's quest to minimize use of harmful or unnatural products. Although the minerals used in these cosmetics are not organic, they're seen as safe to use- if not beneficial for skin. The finish from mineral makeup is silky and luminous. It has a smooth, velvety texture. It makes skin look really rich and healthy and most gives it a bit of a glow. For those with dry, or ageing skin, the hype may be lost on them. That's because powder is usually not their friend. It can dry out the skin and give it a nasty flakey look. Make sure that your skin is well hydrated, but that the moisturiser is completely absorbed into the skin. Apply the mineral make up foundation, then wet your hands. Dab the wet hands over your skin. Use a brush to smooth it down again if it looks uneven. Other negatives are the actual life of the makeup when it's been applied, and for some people - coverage. 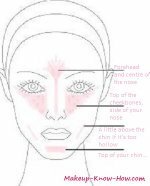 A primer before putting on the makeup will create a layer between the skin and the makeup. This will prolong the staying power of any foundation because it'll take longer to dissapear into the skin. For most people, good quality mineral foundation gives good coverage. If you don't get as much coverage as you need from the makeup, it's best to use a concealer on the trouble areas first. This will take away the benefits of the absence of allergens from the mineral makeup though. So if you're using the makeup for it's friendlienes to sensitive skin, try covering the blemishes more precisely. Do this by dabbing them with the foundation using a concealer brush. Now here is a rundown of some of the ingredients that have been in the limelight. These substances are there in all regular makeup. They're just more effective in mineral formlas because there's less interference from the 'baddies'. If you'd like to look more into the safety of these ingredients, skin deep is a very informative product safety database. Titanium Dioxide also acts as a bit of physical sun protection. Its an ingredient of most sunscreens. Sun protection is always welcome! Micronized Titanium Oxide is titanium oxide that's been crushed into teeny tiny particles. It's more translucent than it's regular sister, and offers a bit more sun protection. There has been concern that the particles are broken down so much(into nanoparticles) that they absorb into the skin and become toxic. Judging the safety of your cosmetics boils down to personal decisions as to who to believe, and which risks you're willing to take. Mica acts as a pigment extender and brightner. It's are filler in most foundations. Because it reflects light it lends the makeup that luminous finished look. Bismuth Oxychloride is a debatable ingredient in Mineral products. It gives the makeup a smooth, pearly feel on the skin. Many Mineral makeup brands have removed it from their products. It is suspected to be an irritant, even if only for people with extremely sensitive skin. For the regular jane, there's often no cause for concern. Today, shelf after shelf is packed with products claiming to be mineral make up. They have the right to do so, because they do contain the minerals. There are no laws that govern the definition of mineral makeup. In reality though, they are misleading because they contain added products that belong in regular makeup products. So if you have sensitive skin, check out the label first to ensure that you're dealing with a mineral product. Firstly, it has to be in powder form. This is because any liquid product has to contain a preservative, or else it will get contaminated. Preservatives are one of the ingredients that are most likely to irritatate sensitive skin. So once you've narrowed down your powdered mineral products, check to see which one has the shortest list of ingredients.